Orange County District Attorney Tony Rackauckas pushed back last week against critics of his successful prosecution of 10 students who tried to shut down a speech by Israeli Ambassador Michael Oren last year at the University of California, Irvine. Since a jury convicted the 10 who stood trial on two misdemeanor counts Sept. 23, Islamist groups and their allies have decried the case as an assault on the First Amendment sure to chill political speech. The students were charged criminally solely because they are Muslims, the argument goes, and because they dared challenge an Israeli official. Rackauckas' response? Bunk. In a column published by the Orange County Register, he said the case stands in defense of free speech, no matter how hard critics spin. "History tells us of the dire consequences when one group is allowed to shout down and intimidate another or a group of people so as to not allow them to have opinions or be heard. History requires us to draw a line in the sand against this sort of organized thuggery." One man's organized thuggery apparently is another man's basic right. The verdict is "a sad day for democracy when nonviolent protestors are criminalized by their government and are found guilty for exercising a constitutional right," said Muslim Public Affairs Council President Salam Al-Marayati. "You can heckle the President, you can heckle high ranking government officials, but if you heckle an Israeli diplomat you will be prosecuted. These are Americans exercising their freedoms. This is a democracy not a dictatorship." "I believe the heart of America has died today," said Shakeel Syed, executive director of the Islamic Shura Council of Southern California. The Islamic Circle of North America echoed that sentiment, calling the verdict "a blow to the civil rights of Americans across the country." In a statement, it said, "the guilty verdict undermines the very foundation of non-violent protest, which has been an integral part of America's history and is continually promoted by America across the globe." "The censorship of dissident voices cannot be accepted in the United States, yet today we witnessed just that. This case was a selective application of justice, and this verdict is a blow to the civil rights of Americans across the country." Hyperbole aside, California has a specific statute which makes it a crime for anyone who "willfully disturbs or breaks up any assembly or meeting that is not unlawful in its character." If your state doesn't have a similar law, a copycat protest is less likely to end up in criminal court. Nevertheless, Hussam Ayloush, who runs the Council on American-Islamic Relations (CAIR) Los Angeles office, called the students "true American heroes" in the tradition of Martin Luther King and Rosa Parks. "They peacefully and courageously stood up against injustice, and they defended our collective freedom of speech. No topic should be off limits and no public official or country should be above criticism." Rosa Parks famously refused to get out of a bus seat. She never tried to silence anyone. Martin Luther King never got 10 friends together to shout down Bull Connor. The Civil Rights movement used non-violent, often passive acts of civil disobedience. What's more heroic – orchestrating a plot to disrupt a speech or knowingly risking savage beatings and incarceration to showcase the fundamental injustice of Jim Crow segregation? But that martyrdom narrative has been embraced by the media and the American Civil Liberties Union. "If allowed to stand, this will undoubtedly intimidate students in Orange County and across the state and discourage them from engaging in any controversial speech or protest for fear of criminal charges," said Hector Villagra, executive director of the American Civil Liberties Union of Southern California. The Orange County Register editorialized that the state was correct that a "heckler's veto" stifles speech. But it was still wrong to prosecute the students because it amounted to selective prosecution. "We wonder if the same group of UC Irvine students had interrupted a campus lecture on chemistry or biophysics, would the District Attorney's Office have filed criminal charges?" That is the point. No one orchestrates a campaign to stop someone from speaking about chemistry, or biophysics, or even other hot-button issues of the day. The selectivity is by the students from the UC Irvine Muslim Student Union (MSU), in deciding that anything Oren had to say was null and void and should not be heard. "[O]ur goal should be that he knows that he cant (sic) just go to a campus and say whatever he wants," MSU meeting minutes show. Members were advised to "push the envelope," in order to "realize our role as the MSU of UCIrvine." Those internal minutes and emails, first exposed by the Investigative Project on Terrorism last year, show that the students rejected more traditional forms of protest and made silencing the ambassador their goal. In addition, and this is something their allies ignore, the students agreed to lie about the role the Muslim Student Union played in orchestrating the plot. 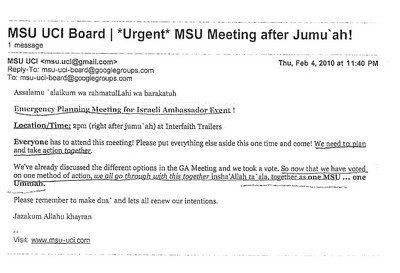 Even though MSU officials devised the plan, wrote the script for what protesters would say and identified who would participate, one email entered into evidence instructed MSU members to deny the organization's involvement. For their deception, they are lauded as heroes. More than 200 people attended a town hall meeting Sept. 25 at the Islamic Institute of Orange County in Anaheim. The audience heard from the students themselves and a series of speakers who heaped praise on them. Host Shakeel Syed, a member of the Islamic Shura Council of Southern California, asked for a standing ovation, saying "we honor the 10 young men of the United States of America who made history in U.S. Irvine 18 months ago." Yet Muslim community leaders have said they are willing to silence speakers they disagree with, regardless of the consequences. Taher Herzallah, one of the convicted students, is the national campus coordinator of American Muslims for Palestine. "I feel no shame in what I did,"Herzallah said in an interview published last week. "On the contrary, I feel I was performing my civic duty by speaking truth to power and would be willing to do it again in a heartbeat if given the opportunity." Hussam Ayloush, Executive Director of the Council on American-Islamic Relations (CAIR), said during a sermon on Friday that as Muslims "we will remain committed to speaking the truth no matter what the price may be." At the town hall meeting, Ameena Qazi, deputy executive director of CAIR's Los Angeles office, blasted the prosecution as inherently corrupt. "I don't know how else to describe what they did. If it's not corrupt to spend millions of taxpayer dollars on two misdemeanor offenses, I don't know what corruption is," she said. "If it's not corrupt to suppress free speech for these students, our community because they oppose inhumane Israeli practices, I don't know what corruption is." It is unclear what Qazi based her multimillion dollar prosecution price tag on, or what message it sends students to encourage their attempted cover-up. After the verdict, Qazi lamented its effect. "Already at UCI there's an intense level of anti-Muslim sentiment," she told Reuters, "and this verdict chills free speech and activism and sends a message around the country that Muslim students are going to be treated differently from other students who protest." But the verdict does no such thing. Students still have the right to protest, provided they do not violate the rights of others in doing so. They can picket. They can engage in silent protest or ask speakers they don't like the most challenging questions they can devise. "The successful prosecution of the 'Irvine 10' will not 'chill' free speech rights of hecklers," wrote Harvard Law Professor Alan Dershowitz. "No one should or would be prosecuted for simply booing the content of a speech, leafleting a speaker, holding up signs in the back of the auditorium, conducting a counter event or demonstration. It was these young criminals who were trying to chill, indeed freeze, the constitutional rights of the speaker and those who came to hear him. They should not be treated as heroes by anyone who loves freedom and supports the First Amendment." 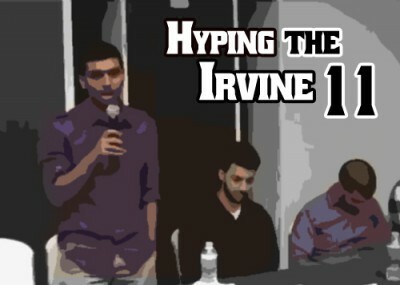 I support the prosecution of the Irvine 11. They are more than welcome to exercise their free speech. They are not allowed by the state of CA from preventing others from doing so as well. Sorry but that is the Law. The court has decided the Irvine11 broke the law. If the Irvine 11 wanted to exercise their free speech in this instance, they would have been welcome to do so outside the forum or request equal speaking time (if the forum decided to allow it). Shouting down someone giving a speech is not exercising the First Amendment. It is being belligerent and deliberately provocative. It is ok to burn Quran, hurl abuses at Muslims, harass them, discriminate against them but you cannot protest against Israeli ambassador. Shame on people who support the prosecution of Irvine11.